Image caption Wang Yi said his talks with North Korea's foreign minister were "very thorough"
China's foreign minister has told his North Korean counterpart that Pyongyang should stop carrying out nuclear and missile tests, hours after fresh sanctions were agreed by the United Nations Security Council. 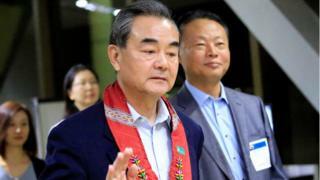 Wang Yi said he urged Ri Yong-ho to abide by UN resolutions in a meeting on Sunday in the Philippines. He did not say how Mr Ri replied. Saturday's resolution banning North Korean exports and limiting investments in the country was passed unanimously. Mr Wang said sanctions were needed, but "are not the final goal", and he urged dialogue. He said he had told North Korea to remain calm, and not provoke the international community with more tests. The Chinese envoy also urged the US and South Korea not to increase tensions, saying that the situation was at a "critical point", but also a juncture at which talks could be resumed. US envoy to the UN Nikki Haley earlier said North Korea was facing "the most stringent set of sanctions on any country in a generation". 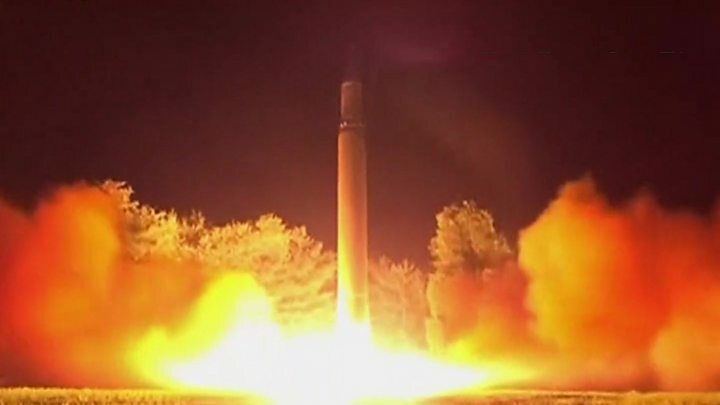 Pyongyang tested two intercontinental ballistic missiles in July, claiming it now had the ability to hit the US. However, experts doubt the missiles can hit their targets. 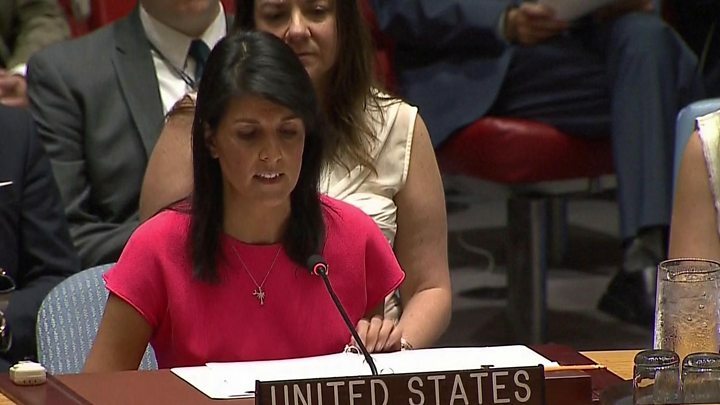 China, North Korea's only international ally and a veto-wielding member of the UN Security Council, voted in favour of the resolution after negotiations with the US that Ms Haley said were "tough". Beijing has often protected Pyongyang from harmful resolutions in the past. Russia, which the US has also criticised for its economic links with North Korea, also voted for the sanctions. Media captionNikki Haley: Resolution "put the North Korean dictator on notice"
Top diplomats including US Secretary of State Rex Tillerson are gathered for a regional forum under the aegis of the Association of Southeast Asian Nations (Asean) in the Philippines' capital, Manila. North Korea's nuclear programme is expected to be a major issue but there are no plans for a bilateral meeting between Mr Tillerson and the North Korean representative. Speaking earlier as he sat down for talks with South Korean Foreign Minister Kang Kyung-wha, Mr Tillerson said the sanctions were a "good outcome". The steady advances in North Korean missile technology have lent a sense of urgency to US diplomacy in Asia, and Rex Tillerson's attendance at the Asean Regional Forum is well-timed. The US wants a show of unity at this forum in condemning North Korea - uniquely, Mr Tillerson will find himself in the same room as his North Korean counterpart, Ri Yong-ho, although the two are very unlikely to speak to one another. Mr Tillerson will also be holding bilateral meetings with his Russian and Chinese counterparts. Just by being at this diplomatic talkfest Rex Tillerson will offer a striking change of tone. In the first seven months of the Trump administration his voice has been subdued on Asia, whereas the president's comments have been seen by many Asian officials as erratic and at times inflammatory. However there are important differences over how best to deal with North Korea. The US believes pressure must be ramped up on Pyongyang, to get it to reverse, not just freeze, its nuclear and missile programmes. Many Asian countries fear the Trump administration's growing anxiety and anger over North Korea's missile tests risk escalating into a dangerous confrontation; there is still a broad consensus in this region that engagement, however frustrating, is the only way forward - so the US bid to have North Korea expelled from the Asean Regional Forum will meet plenty of resistance. US President Donald Trump tweeted to say the sanctions would cost the North more than $1bn (£0.7bn). The export of coal, ore and other raw materials to China is one of North Korea's few sources of cash. Estimates say that North Korea exports about $3bn worth of goods each year - and the sanctions could eliminate $1bn of that trade. But China's participation will be key and top US diplomats say they will be keeping a close eye on Beijing to make sure it consistently abides by the sanctions. Earlier this year, China suspended imports of coal to increase pressure on Pyongyang. However, repeated sanctions have so far failed to deter North Korea from continuing with its missile development. Beijing is also furious about the deployment of a US-funded missile defence system in South Korea and wants it to be scrapped. Media captionNorth Korea missile "seen from Japan"
North Korea has is yet to officially respond to the new sanctions. A senior official told South Korea's Yonhap news agency: "We will make our stance clear when things are determined." But ruling party newspaper Rodong Sinmun earlier said nuclear action or sanctions taken by Washington would lead to an "unimaginable sea of fire" engulfing the US. What can the outside world do? The isolated state's repeated missile and nuclear weapon tests in breach of UN resolutions have been condemned by neighbours in the region. But South Korea says it may hold direct talks with the North during the Asean summit. Its foreign minister said she was willing to talk to her counterpart from Pyongyang, if the chance "naturally occurs". Altogether, 27 nations are sending representatives to the Asean Regional Forum. Asean's 10 member states issued a joint statement saying they had "grave concerns" over North Korea's actions, which "seriously threaten peace".